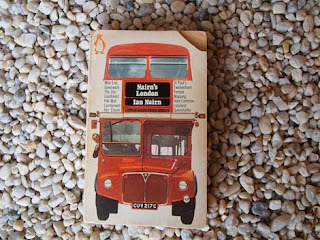 Nairn’s London by Ian Nairn is long out-of-print, but I have just borrowed a copy from my wife’s uncle. Published in 1966, and with his name and family home written in careful loops on the inside cover, it is the perfect antidote to Pevsner. Pevsner’s guides are a stunning body of work – an almost comprehensive inventory of the buildings of England – but they are technical, architectural, concerned primarily with the buildings themselves, rather than what they bring to the feel of a place. 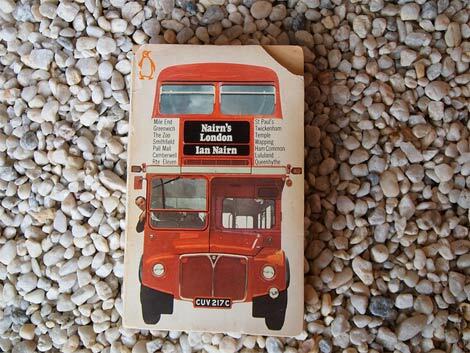 Nairn’s book is witty, subjective and journalistic. In a few choice phrases, he reveals a place's character without denuding it. He is often extremely funny but never trite, and a short entry on a familiar building or street makes one hungry to re-visit it, to loiter around it, and to soak up its moods. Nairn is especially good on pubs, because he clearly spent an awful lot of time in them. 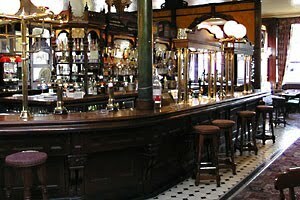 They were where he got the real gist of a place, and where he slowly killed himself with Guinness. 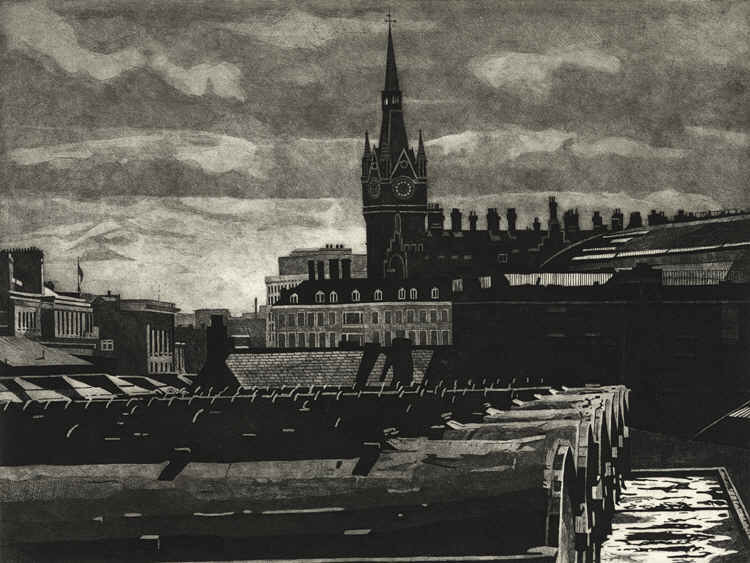 St Pancras is the most Continental of London train sheds. By comparison, the others are put together additively, like an English cathedral; this is one huge all-embracing sweep of the same family as Hamburg or Cologne. A vast throbbing hangar; the phrase needs to be repeated sixteen times to make enough weight in the book and convey the overwhelming solid force of this beginning or end to journeys. It is painted light as some kind of campaign to 'brighten the image of British Rail', but its only true colour is jet black. Gasholders loom up at the far end of the platform. They are worth a closer look, and to get there turn right out of the station. The concoction in front of the shed is by Sir George Gilbert Scott, incredibly clever in composition and incredibly heartless. No Victorian quaintness here, in this competent reckoning up of fees-per-crocket. Right again, and you are in Midland Road. You might as well be round the backside of New Street at Birmingham or London Road at Leicester. It is one of the most astonishing transformations in London, a jump of a hundred miles in a few yards, achieved with the unemphatic red brick and hypnotic arcading of the Goods Station. London for a moment - and just for a moment - seems fussy and flurried, using two words where one will do. Anyone whose heart was lost to bricky Leicestershire would find this place unbearably nostalgic. Up Midland Road to the traffic lights, turn right under the railways bridges; then, in Goods Way, the gasholders come back, a cascade of intersecting circles, a shout of sheer joy from the most unlikely place. All of them come to the party equipped with classical columns, simple Doric and a kind of gasholder Composite. The nineteenth-century equivalent of a Baroque angel is not a Victorian angel but a Baroque gasworks. The whole of this place at the back of St Pancras is incredibly moving: tunnels, perspectives, trains on the skyline, roads going all ways. If you get nothing from it at first, stay there until something happens: it is really worth the effort. Overwhelming honesty, taken to the point where it is something far more than a component virtue. The shape is the building, a point made straight away by comparison with the clever fribble on the front of St Pancras, next door. The defects are the building, like a drawback in someone's character which flows inevitably from their good qualities. Cubitt provided two identical train sheds side by side and scorned any of the deceptions which the nineteenth century would gladly have provided to disguise the fact. Nothing but yellow brick, grand proportions, and in the last few years the eerie other-worldly whinny of big diesels. Outside, two sheds, hence two huge brick arches. A clock, hence a turret perched in the valley between them, spoiling the composition in an academic sense, yet right on a deeper level. Cubitt wanted a brick tower here, which would have satisfied both. It was cut out of the budget, and he scorned subterfuge. The railway reorganisers need their noses rubbing in this quality until they feel it as impossible for the station to go (it is due to be replaced in the 1970s) as it would be for the Church of England to demolish St Paul's.